Home » Uncategorized » Well, this is new… Brad the sports writer. Well, this is new… Brad the sports writer. This is new. Yesterday was my birthday. And I think that maybe God gave me a pretty cool gift. As some of you know, I’m a fairly avid fan of MMA… mixed martial arts. And I know that doesn’t make sense to everyone… a pastor who likes MMA? But I love the discipline and focus that comes from martial arts. And although I’m not kosher with everything you will see on an MMA Pay Per View, I love the sport. 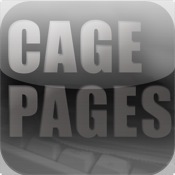 Yesterday I was offered a (non-paid) role with “Cage Pages” a global web site focused on MMA. I will be a sports writer focused on writing a weekly blog article with a unique focus. You can also find me on the ‘cagepages’ iPhone & iPad app. My role is to speak to manhood, fatherhood and spirituality in the sport of MMA. Sounds pretty cool huh. And those of you who know me know just how excited I am about a platform that lets me speak directly to young men in America. And MMA is by far the fastest growing sport for that group. My first article is already written and should be published on http://www.cagepages.com sometime tonight or tomorrow. It is about Matt Hughes, a fighter, father and husband who is competing tomorrow night at UFC 123. And by the way… if you do go to that site… make sure that you make comments there. You can help win me some big points as the new guy by doing so. Thats a cool role! What a neat way to get the message across. I love the christian line (Jesus didnt tap) @ http://www.nosubmit.com (which is currently under construction) but they have some nice MMA gear with a christian theme..there’s not too many of ’em out there. -Nowadays, I’m learning to be more simple,frugal & finding ways to give back to those in need by making small sacrifices i.e.giving clothes away. By the way, ran into John (Pastor of Faith center) at 1st Baptist Paducah during Vision of Hope charity event tonight for orphans in Tanzania..he asked about you. It was a great night & their band ‘Consumed’ did a awesome job. Thats awesome B-Rad!! I’m looking forward to reading the articles.